Pressures from 450 to 2000 psi - Steam generating boilers are equipped with at least one gage glass. It indicates the level of water in the boiler so the operator can be assured that the level is within safe limits. The level must be high enough to completely cover all parts of the heating surface to prevent overheating and low enough so that water is not carried over with the steam. All such boiler installations must comply with ASME and CSA regulations. Note the drain valve which permits all the connections to be blown through daily to be sure that they are not plugged with sludge or sediment. The valves can be slow or quick opening. This method of attachment is commonly used only on boilers that provide a straight vertical surface, unobstructed by reversing chamber or smoke box, such as the cast-iron heating boiler or some types of vertical boilers. A more usual construction is to have the gage glass connected to a water column which in turn is connected to the boiler. The water column acts as a reservoir to dampen agitation in the water. In addition, the column traps any sludge or sediment and prevents it from collecting in the glass connections. 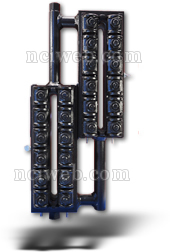 The column also provides a place for installation of high and low level alarms and controls. Trycocks are installed on the column to provide a means of point level detection when the gage glass is being replaced. Note that the bottom of the gage glass must be 76 mm above the top row of firetubes, flue or crownsheet, to prevent overheating. 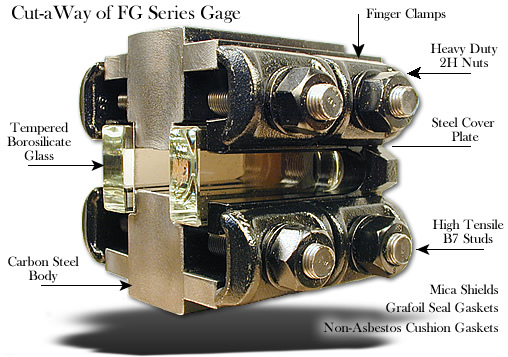 This will ensure that the tubes are covered even when the gage glass shows zero level. Heating boilers have a lowest permissible water level marked by the manufacturer. The lowest visible level in the gage glass should be 50 mm or more above this marker. When a water column houses an alarm, a water level control, or a low-water fuel cutoff device, isolating valves are not permitted in the piping between the column and the boiler. 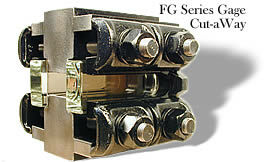 FG Series Gages provide wide body construction for added strength and rigidity. Tempered flat glass composition of premium quality to resist thermal shock. All glass is tested for surface trueness prior to assembly and is protected with a high quality mica shield for steam applications. All models feature finger-clamps which impart a uniform, perpendicular load across the glass surface, assuring gasket tightness. This design allows easy dismantling for cleaning and servicing. A window slot, 5/8" wide, provides high visibility gage reading. For many Prismatic Gages installations, Water gage illuminators are recommended to improve gage readability. MODEL NO. IN. MM IN. MM IN. MM. Three or more window models are available upon request.